Peanut butter, I’m nuts about you. Last week was birthday week. Yes, it’s a thing. I started my actual birthday in the kitchen, food processor running & fresh peanut butter wafting. It was then combined with banana (naturally), sourdough and passionfruit pulp. Plus a side of Harvey Spector & Mike Ross, and birthday breakfast was almost up there with a blueberry & ricotta hotcake at the top. I received wonderful gifts, including Yotam Ottolenghi’s Plenty More cookbook and some Lorna Jane dollars. I’m looking forward to new lycra & plenty more kitchen adventures, so be sure to follow me on Instagram. I spent my afternoon organising a delicious feast for my family, during which my uncle & grandfather helped hide the afternoon shadows for obligatory above table shots and my mother produced a jaffa-flavoured checkboard cake. It was a good birthday. Anyway, I actually do have a point to this birthday bragging. I was given not one, but two jars of peanut butter. One was the result of scrolling through my instagram to check for the right one, and the other was purchased in Tasmania way back in December & has been hiding in Courtney’s apartment ever since. I also received a block of Whittaker’s peanut butter chocolate (you must try), and this cake. A double layer chocolate layer filled with peanut butter buttercream, topped with Ferrero Rochers & Maltesers. Yes. And with several birthday messages referencing the old family favourite, is does seem that in fact I am absolutely nuts about peanut butter and everyone knows it. So, why am I so nuts about peanut butter? – It’s so versatile – sweet and savoury, breakfast, lunch & dinner. – Peanuts share many properties and the health benefits of tree nuts (almonds, brazil nuts, cashews, chestnuts hazelnuts, macadamias, pecans, pine nuts, pistachios, walnuts). – Although high in fat, they are a good source of those good polyunsaturated and monounsaturated fatty acids! – Nuts are also a valuable source of protein and fibre which help keeps us full. Plus the protein makes it a good meat alternative for those vegetarians & vegans. – They are also a source of vitamins and minerals – Magnesium, Iron, Vitamin B6 and Calcium. – Peanuts are actually legumes. Now that’s nuts. – and, it’s just so damn delicious. But there are so many choices, which one do I choose? Go into the supermarket and you are greeted with your standard peanut butter, plus the varieties labelled with light, no added salt and sugar, and then natural. But not all peanut butters are created equal. Ingredients: Roasted peanuts (85% minimum), vegetable oils (antioxidant (320)), sugar, salt. Where to find: Spread aisle. Ingredients: Roasted peanuts (63%), maltodextrin (from Tapioca), sugar vegetable oils (antioxidant (320)), salt, emulsifier (471). Thoughts: Taking the fat out of a product containing a food rich in fats? Seems silly & removing the source of oil will change that texture. So, companies add a food additive called Maltodextrin, a polysaccharide produced from starch. Ingredients: Roasted Peanuts (100%). Some brands have a touch of salt added. Where to find: All brands excluding Sanitarium are in the spread aisle. Sanitarium is in the health food aisle next to the tahini. Thoughts: This option is closest to the peanuts natural state. There are no added oils, sugars, salts or numbers. With Sanitarium selling there jar for a price comparable to your standard PB, price is no excuse to choose the more processed variety. $7.50 is a little pricey – I have purchased Pic’s on special and I assure you, it was worth every cent if you are willing. Tip: Don’t be alarmed if you see oil on top – that’s natural separation. Use your arm strength and give it a really good stir every time you open the jar. Or, keep it stored upside down. 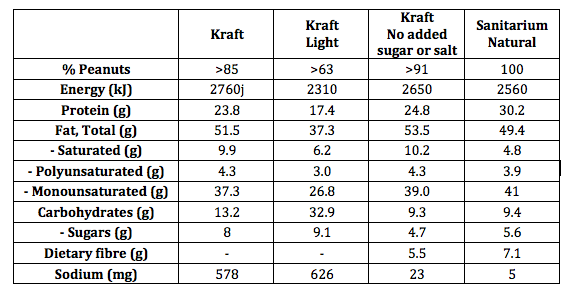 Otherwise you will really understand why Kraft’s slogan is never oily and never dry. Prices (Coles Supermarkets) and nutrition information correct as of February 2015. But guess what. You can go one step even better. Nutritionally the same as your natural varieties but this one comes with the added satisfaction of making your own and the warm wafting smell of freshly ground peanuts from the food processor. But with this have come some successes and some failures. I have found that homemade PB can differ depending on the peanuts. I have found that packet peanuts from the snack aisle do not do the trick. My favourite ones to use are the roasted, unsalted peanuts from the Scoop & Weigh at Coles. This could be due to the saturated fat content of the peanuts. Last year, as the new Health Star Rating started to appear on our shelves I witnessed the following dilemma. Brand B Natural PB (with salt) – 5 stars. How is this so when the HSR ranks a product based on their energy, fat, sugar and salt contents? Peanuts can differ in saturated fat content, and depending on where companies source their peanuts from will determine the HSR. But not to worry, if it’s 100% peanuts you are on the right track. Stick to your portion control (go in with a teaspoon rather than a tablespoon helps), and you can enjoy PB every day as part of a healthy diet. So, my favourite ways to enjoy PB? – Corn thins with a spread of PB, drizzle of maple syrup & dash of sea salt. – Combined with banana and cinnamon within some bready goodness. Toasting it makes it even better. – A small dollop on banana porridge or with banana soft serve. – As a satay sauce in stir-fries, in Gado Gado or on this chicken satay noodle salad. 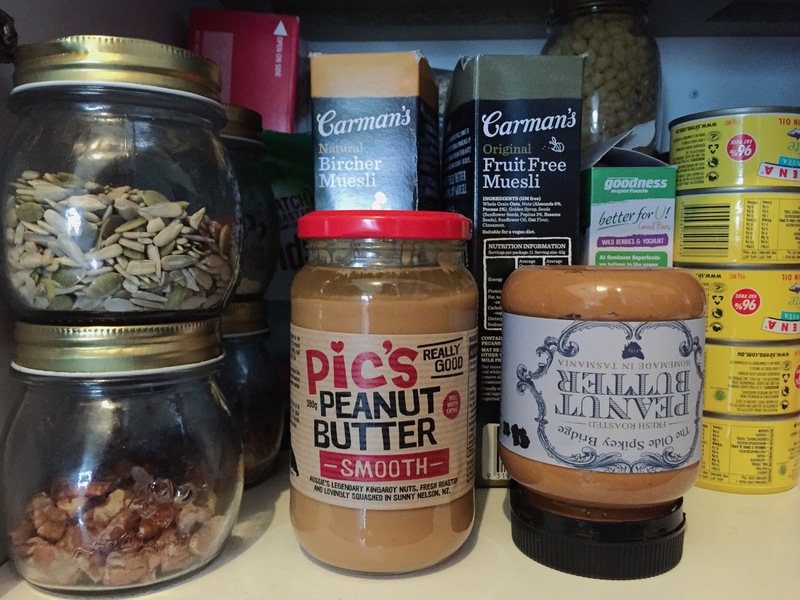 So fellow peanut butter enthusiasts, what’s your favourite PB & how do you love to use it? Until next time, I walnut tolerate silly puns so cashew all later. For more information on the nutritional composition and health benefits of nuts, check out Nuts for life – An Australian Tree Nut Industry Program designed to encourage and promote a daily, healthy handful. < Oh peas, when life gives you lemons.